I’m looking forward to reading the first office action in this case — pretty cool approach for thinking through how to use a hollowed-out asteroid for a manned interplanetary spaceship. In his IDS, inventor Wayne White includes a set of interesting references — including a citation to the Greg Bear’s 1985 SciFi novel EON that included an alien hollowed-out asteroid. 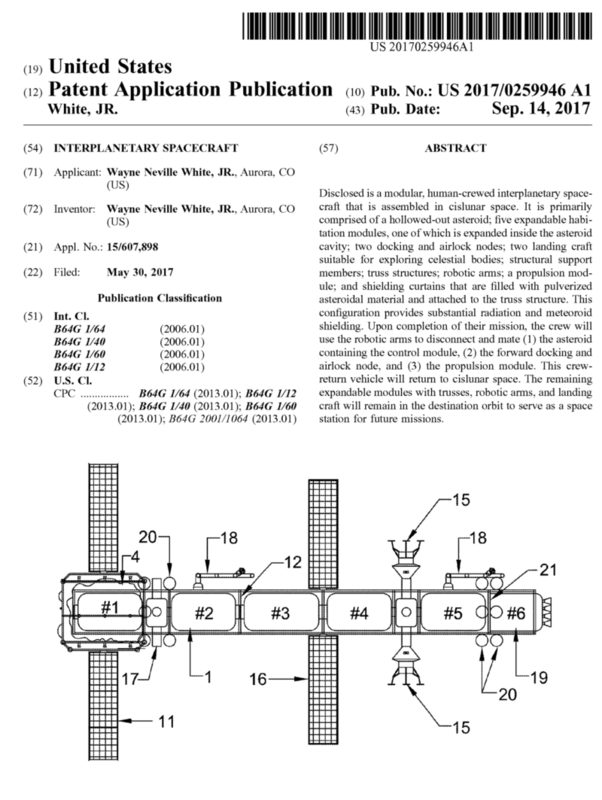 (a) Any invention made, used or sold in outer space on a space object or component thereof under the jurisdiction or control of the United States shall be considered to be made, used or sold within the United States for the purposes of this title, except with respect to any space object or component thereof that is specifically identified and otherwise provided for by an international agreement to which the United States is a party, or with respect to any space object or component thereof that is carried on the registry of a foreign state in accordance with the Convention on Registration of Objects Launched into Outer Space. (b) Any invention made, used or sold in outer space on a space object or component thereof that is carried on the registry of a foreign state in accordance with the Convention on Registration of Objects Launched into Outer Space, shall be considered to be made, used or sold within the United States for the purposes of this title if specifically so agreed in an international agreement between the United States and the state of registry. Gonna need a bunch of continuation practice to keep it alive long enough to get infringed. Quite a lot of overlap with SevenEves by Neal Stephenson, published May 19, 2015, including a hollowed out asteroid attached to the front of the International Space Station to provide shielding. Asteroids are naturally occurring. Digging holes in stuff is old and the hills of Kentucky, as is hiding behind rocks. Abstract idea. 101. I don’t see a dish, or an AE-35 unit…. How they gonna phone home? But seriously, who would infringe? The “fiction” doesn’t need to be “enabling art”. Another (later) reference could provide the enablement; the “fiction” provides the motivation. Especially the notion of “later” being enabling, as it would then be the date of that later enablED item that would be controlling, and that later enablED item itself would be providing the motivation. Thus, the item of fiction would have no place in the analysis. There is nothing wrong about what I wrote. We weren’t talking about dates, except that both references are in the prior art (of course). If you want to keep digging, please use a bigger shovel. You’ll get to China faster. There is no digging on my part and your post is wrong for the reasons given. This is not difficult stuff, Malcolm. Especially the notion of “later” being enabling, as it would then be the date of that later enablED item that would be controlling, and that later enablED item itself would be providing the motivation. It sure sounds like you are saying that art which enables an element provides motivation to manufacture all inventions comprising that element. Is that what you meant to say? If that’s not what you meant to say than I’m pretty sure that nobody here has any idea what you are saying. Take a deep breath and think for a moment. And don’t forget: it’s okay to be wrong! After all, you’ve been wrong many, many, many times before and, hey, you’re still here. Are you (seriously) saying that anything that is admittedly NOT enabling can provide a prior art date if some later item (at a later date) makes the particular item enabled? … and if anything Malcolm, the earlier (and NOT enabled) items may actually serve to show non-obviousness (to the tune of showing an unmet need). The larger point here is that fiction — in and of itself — can never prevent patenting. For items of science fiction, any portions of which if desired to be used as prior art must reach out and find those actual factual items separately for a proper evidentiary basis. Why couldn’t a fictional story also provide an enabling disclosure for prior art purposes? All that matters is what’s disclosed for 102, not whether it is contained in an overall fictional story or not. Sure, the facts that may be present in a fictional story may well be facts. It is just that AS facts, the better source of such facts are the original items to which the facts were made to be facts. It is simply not smart to rely on fiction, as the FACT that a story of fiction is known to be “made up,” and thus invites skepticism even for factual elements. It is simply better form to go to the originating source for any item of fact, my fluid historical pseudonym’ed friend. A fictional book could have a made up patent application disclosed within its covers. The book would be prior art to that which comes later, whether or not found in the fiction section of your local library. And such disclosure could be used to reject claims under 102 if it is also enabling. No? No. That is not how this stuff works. Fiction that uses factual items is still fiction (while the factual items used remain factual items). IF you want to say something written with fiction contains facts (along with enablement of those facts) then the item you wish to “use” is NOT the fiction portion. Can a work of fiction include factual items including an invention with enablement? Sure. Does such earn the status of “enabled” (presumption) as does a printed patent? No. Come now, my historically fluid pseudonym friend, you are trying way too hard for way too minor of a point of difference. The bottom line remains: the best source for facts is not fiction. We will have to agree to disagree. A prior art reference discloses what it discloses, there is no “fiction” exclusion and this discussion of “facts” in “fiction” misses the point. You are not paying attention, Poe. Certainly, facts are facts – no one has suggested or argued otherwise. Certainly, facts may be present in a work of fictions – again, no one has suggested or argued otherwise. What you fail to grasp though, in that a work of fiction that takes existing facts from other places, it is those other places that are the BETTER source of citation for the facts being asserted. Fiction — on its own — is NOT presumed enabled. Sure, something may be enabled in a work of fiction (and yet again, I am not arguing otherwise). But that does not change the FACT that fiction is not your best source of original factual (and enabled) material – nigh, by definition of the work BEING fiction. And very much so, the portion which MAKES the item to be fiction is the very thing that is a drawback for use in the legal realm. By the way, thanks for the link, but a story on SSRN does NOT make the case that you think is made. What you see there is a bit of a shameless plug for Google (and there is a host of issues with Google undertaking that project, by the by). fiction — in and of itself — can never prevent patenting. It can if you are trying to patent fiction. If one is “trying to patent fiction,” then it is NOT prior art that is brought to bear; so no, you are again wrong. I might have to look through those sub-groups though. I have an old somewhat non-fiction book from my youth that has one of those.